Immersive Shooter Editor-At-Large and Professor Robert Hernandez tests Gimbal Guru’s latest piece of hardware–the Guru 360 rover. Here’s what he learned after a day of driving the dolly around campus. As the 360 market evolves, creators are having to focus less on the tech, giving them more of an opportunity to focus on the craft of immersive storytelling. One emerging storytelling trend is to use dollies to add a bit of dynamic motion of 360 films. Earlier this summer, I had the chance to test out and drive Gimbal Guru’s Guru 360 rover on campus. Now, I’ve used the Double Robotics rover–which really is a brilliant telepresence solution turned 360 dolly–but this new rover has an edge. There are quite a few unique features of the Guru 360 rover. The most impressive (to me) being its unique wheels which allow you to move the dolly in any direction at any time. You aren’t limited to forward and backward; you can also go side to side. Another important and essential feature of this rover is the controller. This isn’t a small kid RC controller or an app you put onto a tablet. This is a real device that feels natural and good in your hands, allowing you to guide it along the path you want to go. But, it isn’t without its challenges. The sound from the machine is a challenge, but one many rovers have. Engines make noiseUndesirable variations of brightness and/or color in an image that typically occur when recording at high ISOs in digita... More. But it’s not something that can’t be covered up by ambient noiseUndesirable variations of brightness and/or color in an image that typically occur when recording at high ISOs in digita... More (recorded separately), background music, etc. Another challenge is uneven surfaces. The goal is to make it a smooth ride as possible, but we have to be realistic that not every surface is smooth. That said, Gimbal Guru’s Devlin Murphy told me they’re looking to add more suspension to the rover to add some more cushion and smoothness. For more details, Immersive Shooter spent some time picking Devlin’s brain on the robotics behind the rover and Gimbal Guru’s grand plan for the Guru 360 rover. 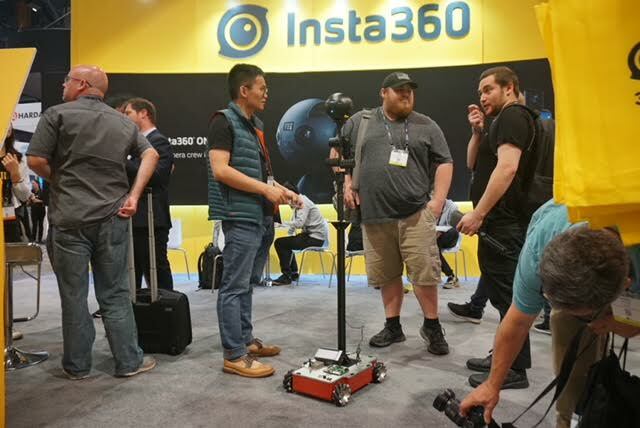 The Guru 360 rover visits Insta360’s booth at NAB. The rover can move in any direction regardless of wheel direction, rotate 360 degrees in place, and turn in an arch, all guided by the user on the remote control joystick from up to four football fields away. The rover body (17.7 x 13 x 4.5 inches, or 45 x 33 x 11.5 centimeters) is small enough to remain invisible when using with a flat camera and barely visible when shooting with a 360 camera (though this depends on the camera used and the height). The body of the rover also has tie-down loops to secure accessories, like external batteries, to the rover. 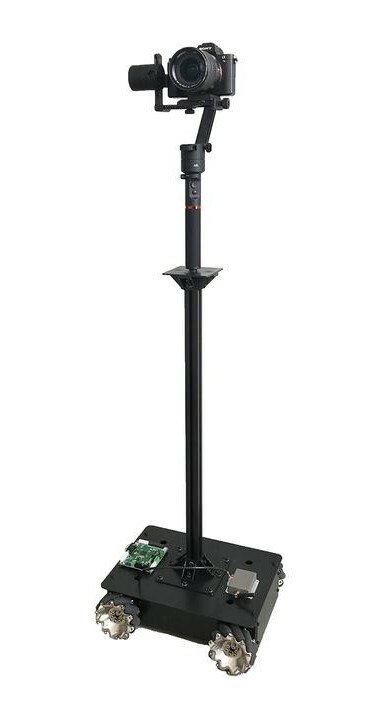 It also comes with a detachable, height-adjustable stand designed to be used in conjunction with gimbals, a vibration isolator, and your camera system. The rover and battery weighs 35 pounds, or 16 kilograms, and can support a payload of up to 44 pounds or 20 kilograms. The 12V battery has a 10-hour run-time or a 30-hour standby time. It can move at speeds from a slow crawl to a brisk walk (.75 meters per second). The rover is currently available at a discount ($5,999 versus $6,499 upon launch) during this pre-sale period, and is expected to begin shipping within the next 3 months. I know this rover works for both flat filming AND 360. But, what features in particular make it a good fit for 360? 360 video is a lot like fishing. You put the camera down and hope for the best. But, with a rover, you can move with the action and get more dynamic shots. That’s true for both flat and 360 video. For 360, the ability to move in tight spaces–human environments–was also really important. We wanted it to be able to maneuver through a kitchen or down a hallway. Our rover can rotate 360 degrees within its own body length. It can move forward and back, right and left, and even diagonally. To do this, we went with mecanum wheels. They aren’t as soft or vibration-resistant as pneumatic air wheels, but they do offer that tight maneuverability. We wanted to be sure it could navigate through a home or other interior spaces, not just outside in the open. That’s one thing people at NAB (where we first launched the rover) really responded to–how well it could maneuver in tight spaces. Our rover also has a smaller footprint, compared to larger rovers. It can carry about 45 pounds, compared to some rovers that can carry hundreds of pounds of stuff. But, at that point they’re really expensive and they’re the size of a Barbie car which makes 360 more complicated. I estimate that, depending on the camera and the height you’re filming at, our rover takes up only about 10 percent of the sphere at the nadirThe bottom of the sphere. that would need to be patched in post. 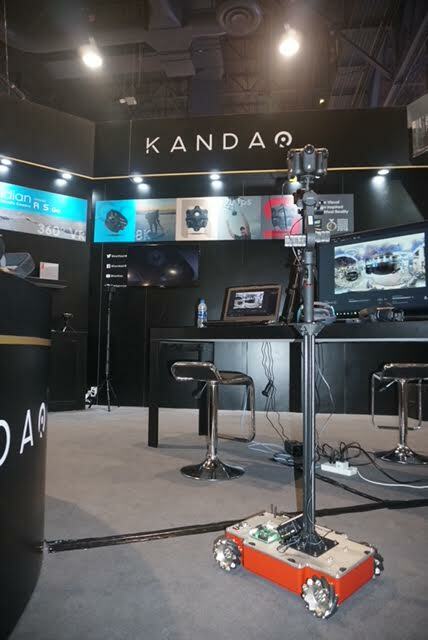 Gimbal Guru’s Guru 360 rover visits Kandao’s booth at NAB. What made you decide to build the Guru 360 rover (and your first rover!)? We felt that there was an opportunity for a better performing rover at a lower price point, so we set out to make one. Originally, we were hoping to hit the $3,000-$4,000 price range (which we couldn’t do without making some sacrifices in quality) that was better than other affordable rovers that are often made with RC components and are very twitchy. We knew our customers would prefer control rather than speed, and that’s what we did with the Guru 360 rover. We’ve given more control back to the operator. A lot of cheaper rovers are all-or-nothing. Fast or parked. Ours can move millimeters–it can literally crawl an inch a second. At top speed, it can do a brisk walking pace. And that range is probably perfect for 360 where you want steady control that feels like natural human movement (like a walking pace). Of course, we have our gimbals, but if you’re using one of those and moving, your operator is right there holding it–and you don’t always want that. This gives the operator a chance to be in the background or even out of the shot while still getting some dynamic movement. The wireless remote has a range of 383 yards, or 350 meters. That gives immersive shooters plenty of room to hide, but what about being able to actually drive the thing while hiding? So far, we haven’t gotten too far from the camera since we’ve been shooting in public places (and we don’t want people to trip on the rover). But, in the instances that we have wanted to hide, we’ve been in places we’ve known well enough to operate blind. You could also attach a cheap camera (flat or 360) with live preview to the rover and use that as a slightly delayed live view to help you drive while hiding. Is it possible to “lock” speeds or program paths or speed changes? You have to always be guiding the rover. There are three speed levelsThe adjustable sensitivity settings of microphones. Levels are set (and changed as necessary) to best capture the vocals... More and a joystick on the remote. So, if you wanted to move at a constant speed, you could select your speed level and then set up the rover a bit before what you want to capture to bring it up to full, constant speed at any of those three preset levelsThe adjustable sensitivity settings of microphones. Levels are set (and changed as necessary) to best capture the vocals... More. Or, you could move move more slowly/between those levels–then, you’d just need to develop the muscle memory to maintain your own constant speed with the joystick. What accessories are needed that aren’t included in the price of the rover? A vibration isolator? A gimbal? For the majority of uses, you wouldn’t necessarily need a vibration isolator. You’d probably want to use it if you’re moving at a fair speed and changing directions often, or if you’re off-roading a bit. It isn’t a mandatory accessory for the majority of shooting situations, but if you have it on there, it could reduce the vibrations. Also having a gimbal on there will help, in terms of keeping rolling in check and also to turn the camera without turning the rover. It could also dampen the rover’s movements and make it a bit smoother. We actually haven’t yet found out how long the battery lasts! We drove it around for 3 days at NAB and then Hugh [Hou, from CreatorUp] and I took it to Griffith Observatory before we ran out of juice. We do know it takes about 3 hours to fully recharge. I know this one just launched, but do you have any improvements/plans for another rendition? While we were at NAB, some people suggested adding the option to raise and lower the camera while the rover moves. We also heard from people that an off-road version would be helpful, so we might do those on a production-by-production basis. The Guru 360 rover is currently available for pre-order for $5,999 ($500 off its full retail price), and is expected to ship in the next three months. Robert Hernandez, aka WebJournalist, has made a name for himself as a journalist of the Web, not just on the Web. His primary focus is exploring and developing the intersection of technology and journalism – to empower people, inform reporting and storytelling, engage community, improve distribution and, whenever possible, enhance revenue. He is an Associate Professor of Professional Practice at USC Annenberg, but he’s not an academic… he’s more of a “hackademic” that specializes in “MacGyvering” digital journalism through emerging technologies. His most recent work includes Augmented Reality, Wearables/Google Glass and Virtual Reality — he and his students produce VR experiences under their brand: JOVRNALISM. Their work can be seen in The New York Times, NPR, ProPublica and in their own iOS/Android app. Hernandez is also the co-founder of #wjchat and co-creator of the Diversify Journalism Project. He has served on boards that have included Chicas Poderosas, InquireFirst and the Online News Association. He is a Journalism 360 ambassador and a lifetime member of the National Association of Hispanic Journalists. He connects dots and people. Immersive Shooter is the go-to resource for immersive journalists and documentary professionals producing 360 video and VR content. We share industry news, gear reviews, interviews with top VR journalists and filmmakers, tutorials and more.